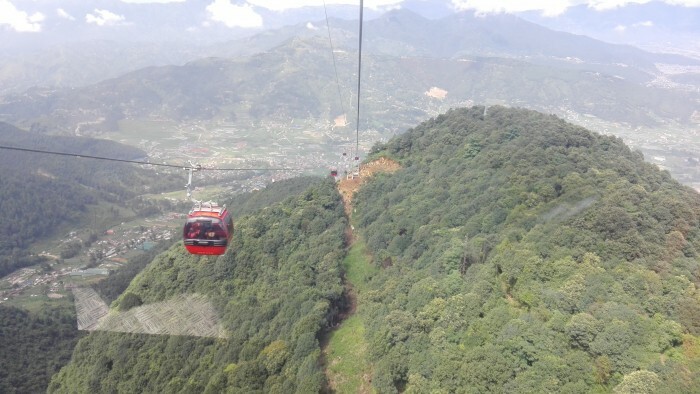 Chandragiri Cable Car tour is a nearest popular hill day tour with cable car ride for mountain views, valley sightseeing and religious temple visit. Chandragiri hill day tour starts from Kathmandu city, after an hour car/van drive, we reach at the cable car station at Thankot. Taking a cable car ride of 10 minutes, we will reach at the top of Chandragiri hill, one of the popular hill station to the southwest of Kathmandu valley. Chandragiri hill offers incredible views many snow cap mountains such as Langtang range, Ganesh himal, Manasalu, Annapurna range and Kathmandu valley. The historically important hill of Kathmandu valley offers panoramic views of Himalayas and southern of Kathmandu. The religious story of this hill is linked with 17th century, king Prithivi Narayan Shah from Gorkha try to capture the states of Kathmandu valley two times but not success. After worshing the Lord Shiva temple of the hill top, He success to win the states of Kritipur, Kathmandu and Bhaktapur. Now, Chandragiri Hills developed cable car to reach the popular holy place and this place became famous among the domestic and international tourist. Thousands of tourist reach there to explore the changing weather and dramatic views of mountain, valleys, jungles and villages near by the capital city of Nepal. Day 01: It takes about 40 minutes’ drive from center of Kathmandu and also there is two option either you go to the top of cable car one way and way back you can walk like day hiking if you don't like this idea you can take both way cable car , it is just a day trip near Kathmandu.